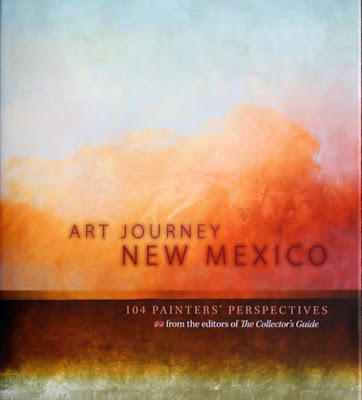 I am grateful and not a little humbled to have had my painting "Forever" included in the new book, "Art Journey: New Mexico" 2009. Though I was contacted and asked to participate earlier this year, the significance of this book did not really register in my mind. 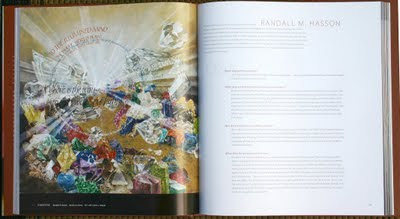 As often happens with things like this, the publishers let me know which painting they had chosen, did an interview with me about the painting, and then I sent the images and kinda forgot about it. When the package arrived today containing this magnificent book I was stunned. There are 104 artists included from New Mexico, a state which boasts the second or third largest art-market in the nation (depending on the year). By rough estimate, there are just under 5,000 artists who are listed in the collectors guide alone... to be included in this 2% is mind boggling. These artists are world class, professional painters that I am honored and not a little bit humbled with whom to share the pages of this large coffee table keepsake. concepts come from the image." I had used cut gemstones as images in a previous painting ... the act of painting them intrigued me, and I began to explore their form and meaning. What prep work and painting techniques went into it? Because I integrate lettering into my work, I use readily available acrylic inks and therefore paint in acrylic as well. I use various mediums and glazes to achieve either the finish or depth/transparency I desire for the subject I am painting. In this particular painting, the gems themselves are painted in multiple glazes and are finished with a glossy varnish layer while the rest of the surface remains matte. 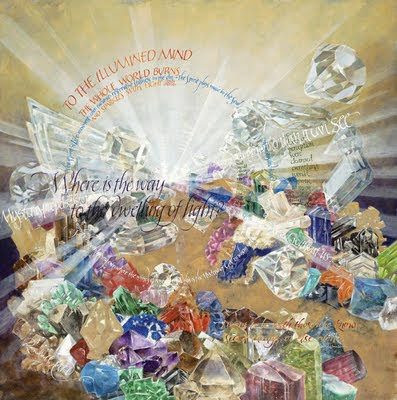 I researched the gemstones themselves-their meaning from a metaphysical, biblical and traditional view, which included such things as the healing properties and also which gems (such as lapis) were used as pigments, and what gemstones where significant biblically. While many times I do have compositions in mind, in this case the painting started with one gem and evolved from there. How does it relate to your other paintings? My works, because most of them contain text, are usually topical or themed. I call them "contemplative" because they are not meant to provide answers, but to stimulate thought and questions. I almost always use symbolism and allegory in the images I select. This particular painting deals with a great or significant subject: faith, mystery, spirituality, afterlife, and so on. The subject matter dictated not only a dynamic composition, but also dynamic movement and color. What does this painting mean to you? It is about the mystery of eternity. It is an asked question without a defined answer. There is a presupposition here on the part of the artist: the concept that there actually is a Higher Being, or God. 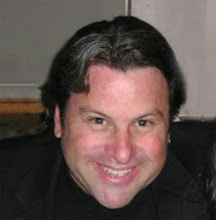 For a traditional Western Christian or Jew, there is a concept of Heaven. But no matter who you are or what you believe, the only thing that is sure is that it won't be exactly how you think it will be. We simply don't know. In the two faiths mentioned above, there is a "Throne" or a "New Jerusalem" described in the Bible. The gems mentioned in those descriptions are in this painting ... but so are many others. Many artists have tried to paint or portray the actual "throne" or the New Jerusalem. I have not because I don't believe any representation by a human can be accurate. That is why the "street paved in gold" disappears over the hill. It begs the questions: Is there a God? What does He look like? Where does He dwell? What does that place look like? Is it active or peaceful? Stagnant or bustling with creativity? And so begins the conversation.